Orbitty is a lot like the green kangaroo Hoppy from “The Flintstones.” He was around, he was on the show, but people often pretend they never existed. When people think of The Jetsons they never think of Orbitty, and when they think of Bam Bam, Hoppy is the last thing that comes to mind. If ever. Around the time the show jumped the shark by adding Orbitty, “The Jetsons” was pretty much on its way to losing its relevance and momentum that it had. And Orbitty became the Cousin Oliver of the series. Though he wasn’t as annoying as Scrappy Doo, he was still fairly unnecessary to the show. In fact the writers only chose to acknowledge him when he had to deliver a cutesy line of dialogue, or had a rare episode revolving around him. The writers make a justification for Orbitty, though. The little furry kitty like thing can fix things. It’s natural ability is to fix things. But the character is so streamline to appeal to kids, it almost feels cold and lifeless. Especially when you consider the character is there to appeal to boys and girls. So it’s androgynous in design with a furry body, it can talk and it purrs like a kitten, it has a purple pompadour and gender neutral colors, and it walks on springy legs a la “The Impossibles.” The introduction of Orbitty is a fairly annoying episode, and one that still begs the question why it even needed to be added on to the show and shoehorned in to the family. It has zero personality and little appeal beyond working as a potential teddy bear, and lacks in interesting storylines. Plus with Astro, why do we need another talking animal? And why was Mac even allowed on to this series, in the first place? Of course Season Two Volume 1 isn’t a complete bust, even if you can sense the writers struggling for ideas, as there are the occasional gems scattered among the season set including “Rosie Come Home” where malfunctions and leaves home assuming the family doesn’t want her. And I happen to be a fan of “Super George” where George becomes a superhero thanks to an experimental super suit created by Spacely. I also like “Haunted Halloween” the stand out episode where the Jetsons all have nightmares of varying segments and monsters after telling ghost stories one spooky night. This is one of the few anthology episodes of the series, and it’s a creative one with some raucous comedy. 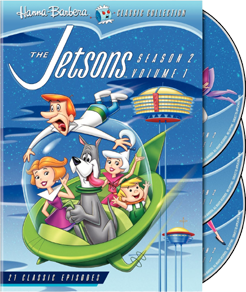 The DVD set features an eight minute segment named “The Jetsons Return to the Future” where WB heavyweights including Andrea Romano examine the show’s mediocre run that led it in to Saturday Morning cartoon hall of fame. All in all you can sense the show is on its last legs with some ideas that work and others that are utterly stretching for the same momentum it had when at its prime, so if you’re willing to deal with the mixed bag, you can enjoy this new boxed set. This entry was posted in Collector's Den and tagged Adventure, Animation, Comedy, Family. Kids, Hanna Barbera, Science Fiction, The Jetsons. Bookmark the permalink.